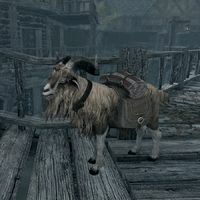 Hilda is a trained goat owned by Halvar in Rorikstead. 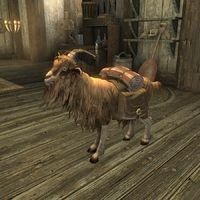 You can buy the goat from Halvar for 200 gold to make it your pet. She comes pre-equipped with an Animal Pack but it can be taken off if you desire. She can also be equipped with an Animal Collar. She is essential and will not engage in combat. Hilda can be summoned using a teleportation spell. She can be instructed to follow you even if you already have another pet following you. You can instruct her to wait at a city, wait at her current location (either temporarily or permanently), wait at your house, or to carry items. Being a pack goat, she has greatly increased carrying capacity compared to other pets. [verification needed — carrying capacty value?] Additionally, there will sometimes be a dialogue option to collect milk from her. Halvar's Journal contains background information on Hilda. This page was last modified on 16 January 2019, at 01:09.